In 1879 Congress passed the Posse Comitatus Act prohibiting the U.S. Army from enforcing U.S. law absent a directive from the President or Congress. Recent images from and events in Ferguson, Missouri, highlighted the trend of arming our police forces through federal government grant and discount programs thereby enabling them to acquire military-grade equipment. Police forces across the country today are, in many respects, as well armed as Army soldiers and local police leaders can mobilize their military-grade forces at their discretion – no approval of the President nor Congress is required. What of the Posse Comitatus Act today? Should citizens accept its implicit circumstantial demise without debate? 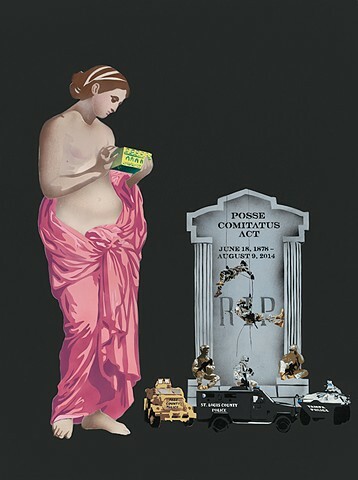 This painting represents the unintended / unanticipated consequences of the federal programs that arm police by appropriating imagery of Pandora from Paul Cesaire Gariot’s “Pandora’s Box”.